Before Prime Minister Narendra Modi embarked on his four nation tour to Germany, Spain, Russia and France on May 29, it was reported that his main focus would be bilateral cooperation on economic (in backdrop of India having passed GST Bill and record FDI inflows of $43.5 billion during 2016-17), defence, science and technology, and nuclear fronts, parleys on EU-India Free Trade Agreement, and fight against terror. The visit was in backdrop of Europe dealing with Brexit and US wanting NATO members to pay more, besides, US pulled out from the Paris Climate Deal while Modi was in Russia. Recently, German Chancellor Angela Merkel had announced Europe could no longer completely depend on others – read US and UK. Berlin was Modi's first port of call, where he met German President Frank-Walter Steinmeier and German Chancellor Angela Merkel, jointly heading with latter the fourth biennial Inter-Governmental Consultations (IGC) begun in 2011. Germany supports India's stand on OBOR and India's bid for NSG membership. During Modi's visit, both countries vowed to take strong measures against those who encourage, support and finance terrorism. Modi said, "Pace of development of our relations is fast, direction positive and destination clear. Germany will always find India as powerful, prepared and capable partner." The two sides signed 12 MOUs/agreements in fields like cyber policy, development initiatives, sustainable urban development, continued development of cluster managers and skill development, digitalization, railway security and promoting vocational training. Modi called for unity of EU and said India would play positive role for it through Germany. Modi and Merkel later also met senior business leaders before inaugurating the Indo-German Business Summit 2017. Germany is largest trade partner for India in EU and has made $2 billion FDI in India during past two years. The Indo-German Chamber of Commerce, with 25 joint working groups, is the biggest German bilateral chamber outside Germany having more than 7,000 German and Indian member companies. Over 1,800 German companies are doing business in India. As for FTA with EU, Modi and Merkel agreed on the need to resume free-trade talks between India and EU soon. Modi's visit to Spain was 29 years after last Indian PM (Rajiv Gandhi) had visited that country in 1988. 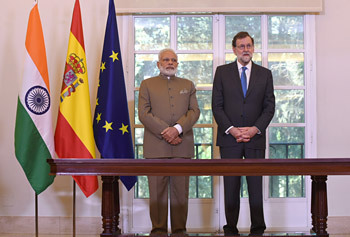 Modi held talks PM with Spanish President Mariano Rajoy, with emphasis was on fighting terrorism, particularly in light of recent attacks in Manchester. The two leaders called on the international community to end selective or partial approaches to combating terrorism and jointly called for early finalization and adoption of a Comprehensive Convention on International Terrorism by the UNGA. Modi thanked Rajoy for Spain's support for India's membership of the MTCR, while Rajoy affirmed Spain's support for India's membership of NSG, Wassenaar Arrangement and Australia Group. Five MOUs were later signed between the two countries in for cooperation in organ transplantation, cyber security, renewable energy, civil aviation and one between India's Foreign Service Institute and Diplomatic Academy of Spain. In addition were two acts on transfer of sentenced persons and visa waiver for diplomatic passport holders. Modi invited Spanish companies to invest in India. Spain is the 12th largest investor in India and 7th largest trading partner in EU. More than 200 Spanish companies are actively involved in road construction, railways, wind power, defence and smart cities in India. Modi's visit to Russia was for attending the the annual bilateral summit between the two nations, as also attend for the first time the St. Petersburg International Economic Forum (SPIEF). The visit was at a time when Russia has stepped up sales of advanced weaponry to China and has increased political and military overtures to Pakistan including sale of offensive weapons, military exercises and accorded political legitimacy to Taliban despite Pakistan's manipulating them for geo-strategic aims in Afghanistan that include limiting India's role in that country. PM Modi and President Putin had wide ranging discussions that covered issues like terrorism and increasing trade and investment. Among the major outcomes of the summit meeting and seven agreements signed was the agreement on setting up of Units 5 and 6 of the Kudankulam Nuclear Power Plant (KNPP) with the Russian help in Tamil Nadu. The reactors will be built by India's Nuclear Power Corporation of India Ltd (NPCIL) and Russia's Atomstroyexport company, a subsidiary of Rosatom, the regulatory body of the Russian nuclear complex. Each of the two units will have a capacity to produce 1,000 MW of power. The two nations have also agreed to: give new direction to defence cooperation; hold the first tri-Services exercises, named 'Indra-2017' this year, and; commence joint manufacturing of frigates, adding on to the co-production of Kamov-226 military helicopters. India and Russia were celebrating the 70th anniversary of their relations this year. A Joint Declaration issued after the talks said that "the Indian-Russian special and privileged strategic partnership is a unique relationship of mutual trust between two great powers." 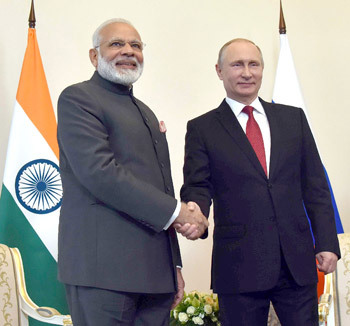 President Putin asserted that Russia's "trust-based" relations with India, which he described as one of its "closest friends", will not be diluted by Moscow's growing ties with Pakistan and other countries. 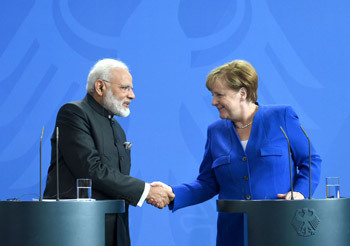 The joint statement issued during Modi's visit included: need to reform the UN and UNSC; Russia reaffirming support for India's permanent seat at UNSC; cooperation within BRICS, multilateral forums and organisations, including WTO, G20 and the Shanghai Cooperation Organization; Russia-India-China cooperation; strong Russian support for India's membership in the Nuclear Suppliers Group and Wassenaar Arrangement; condemnation of all forms of terrorism, call for early conclusion of Comprehensive Convention on International Terrorism, and cooperation in counter-terrorism. The statement also said that India and Russia were looking to expand trade from the current $ 7.7 billion level to $ 30 billion by 2025. 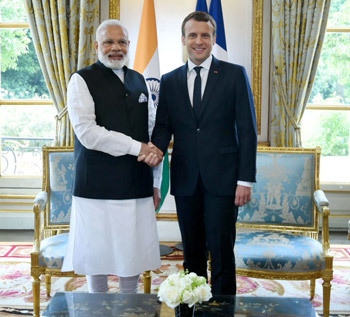 In France, PM Modi met newly elected President Emmanuel Macron for the first time. India and France pledged themselves to a successful implementation of the Paris accord on climate change, and vowed to jointly fight the scourge of terrorism, the two challenges that are stalking the world at large. PM Modi said, "India is with the Paris accord, and even beyond that we will walk together and work together in the interest of future generations. In this direction India and France are taking several measures." Modi and Macron discussed terrorism extensively; how to save the world from terror and radicalization and how to counter it. Referring to climate change and terrorism as two major challenges before the world, Modi said, "We cannot see the danger of climate change but we can see the horrific effects of terrorism, we can feel it. Innocent people, women, children lose their lives to terror. Every child in France knows the face of terror". He also said, "Be it trade and technology, innovation and investment, energy, education and enterprise, we want to give a boost to India-France ties." Macron has accepted Modi's invitation to visit India. This was Modi's third visit to France in the last three years. In 2015, France was the first European country that Modi visited as PM. Last year, he was in Paris to attend the UN climate change conference. His meeting Macron now will keep India-France ties on the upswing. Bilateral ties between India and France have grown steadily: From €5.13 billion in 2006 to €8.5 billion in 2015. France is the ninth largest foreign investor in India. Today, more than 1,000 French companies across a wide range of sectors in India and employ around 3 lakh people. Around 75 Indian companies operate in France, employing around 7,000 people. France was the first country to sign a civil nuclear agreement with India, even before the US Senate had approved the India-US nuclear agreement. India and France signed a strategic partnership in 1998 and has a High Committee on Defence Cooperation. All in all, the four nation tour of PM Modi has promoted Indian interests at the geopolitical level, even as the main focus remained on terrorism, environment and trade. In terms of trade and investments, it is now up to India how we can cut the red-tape and climb up in the 'ease of business' ranking.